The 37th Milo Marathon in Iloilo took place exactly a week ago (August 4, 2013) and it was something worth remembering. 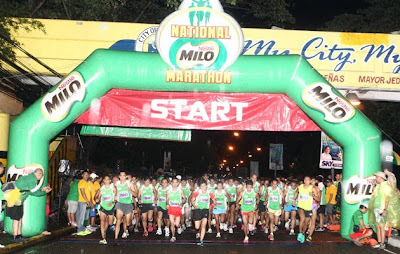 Every participant who were at the venue were all wet, dripping wet to be exact, because of heavy rains around 30 minutes after the 21k started and right before the 10k race started. But despite the rain, the spirit of the participants was not dampened. Many decided to push through and finish the race though running while the rain is raging is never the easiest thing to do. I have to deal with countless puddles of rainwater forming in the road (and other runners intentionally stepping on these puddles to hit other runners with water), the rain hitting my eyes (didn't bring a cap), wet socks and shoes (at least it's not squeaky, thanks Nike), the cold that seems to have reached my bones and back pain probably caused by cold.